Years ago, under my direction, my son, Nikola, made a crook. He was a student at the National High School of Applied Arts. I needed to show him how to make research, collecting information, analysis, and how to create a form on the base of all this information. By working on this project, we made a symbolic connection between the crook and the wand and touched upon values that we call intransitive and universal. 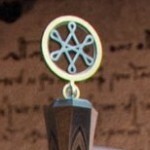 I was intrigued and dared to work on one of the attributes of honor dignity – the wand. I started gathering information but could not find any meaningful definition of Wand. Reading was something like: “Stick with knobs at the two ends”. At least in the dictionary the Wand was defined as bludgeon and bludgeon is a word with a magic meaning. The first thing I`m looking for in sculptural form is architectonic. 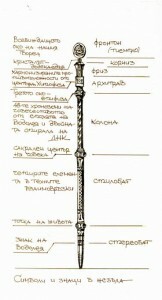 When I start working on my first altar, for the Orthodox Church, different questions stood before me: – How to design the iconostasis in the synthesis of architecture? 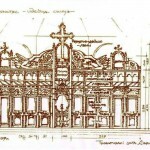 “And then something struck me and I asked myself the question: – “Is there a connection between the architectonics of the facade of the temple and architectonics of the iconostasis”? The later is also viewed as a façade that separates this world from the divine world. I compared the façades and temples of different periods of art history. 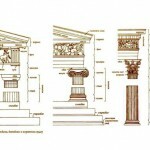 Everywhere columns stand on foundations; their capitals were carrying beams, and were complemented by a frieze and cornice to make them looking sheerer and gable. 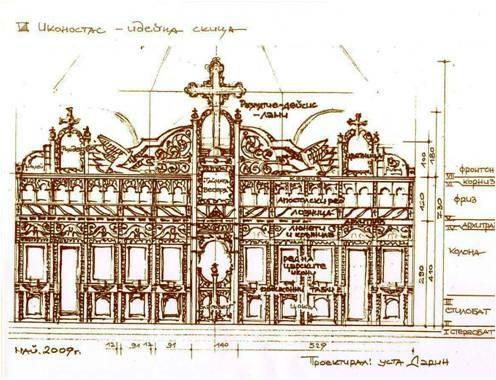 This architectonic structure has become a raw model for all seven iconostasis which were crafted according to my project and under my supervision but only after sixteen years of work I counted for the first time the girdles of the vertical section. Miracle! The girdles are seven – the seven steps of the temple! At the very entrance the façade shows us the way of our spiritual growth: from the first three steps, through the most dynamic part – the colonnade, all the way to the horizontal structure – architrave, frieze and cornice – internally harmonized and balanced, where the strength of the columns has turned into power ready to bear the entire weight of the gable (the gravity of celestial gifts). In order to achieve the knowledge of the Heavenly Temple, one must change – to gain an internal realization when climbing the seven steps of the temple towards the light. 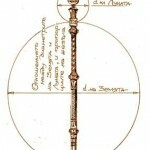 The architectonic structure of the Temple is incarnated into the Wand in order for it to become an instrument in the path to the subtle worlds. The next step was to combine architectonics and symbolism all in one. 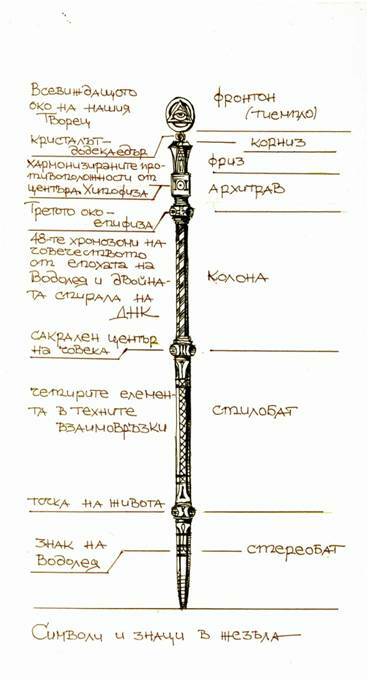 Architectonics showed us the stages of our spiritual growth. Now these steps had to be saturated with content by symbols representing the path of spiritual transformation of humanity of our time – the period of transition from the era of Pisces to the Age of Aquarius. Therefore, I first marked the sign of Aquarius at the base of the Wand and rationalize it as a milestone of time. Most people, who have undertaken the spiritual path of development, look for the natural ways innate even before they were born. An important prerequisite in the process of self-awareness is mastering the four elements of the human – Earth, Air, Fire and Water, and achieve quintessence – the fifth element. The four elements are the primary foundation of the natural forms of our world, formed not through accumulation but through transformation and connection. The secret of the four elements is their opposite position and the same weight. 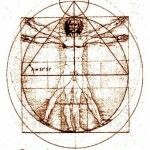 Conversion, modification and refining of the elements occurs inside the human body and for that the ancient alchemists have said: “The four elements are not our four elements”, i.e. their invisible site is slipping away to the purely material (ignoramus) conciseness. . 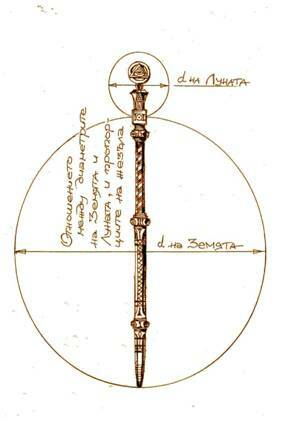 The main elements were already in place within the heart of our instrument for the spiritual path – the Wand! The four elements and the quintessence, as a main substance of man, are displayed together with his star sign – the Pentagram. 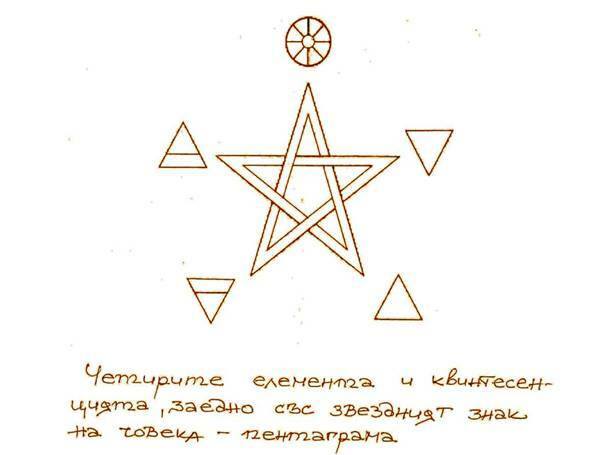 The five-pointed star is a symbol of the human microcosm, and its corners symbolize: ether, water, fire, earth, air. In different religious traditions, this star is associated as well as with female divinity of Venus, so as with the perfect unity of the opposites, leading to merger and unity. 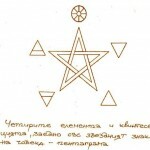 The five beam star most likely leads to the School of Pythagoras, whose sacred number is five. It is known from the symbols of the great dedicated to antiquity – philosopher Plato. With Plato we have spatiality, massiveness, development of information containing the energy characteristics of the main elements. For Plato the principal and most complex piece is the one that embodies the Universe – pentad dodecahedra. . 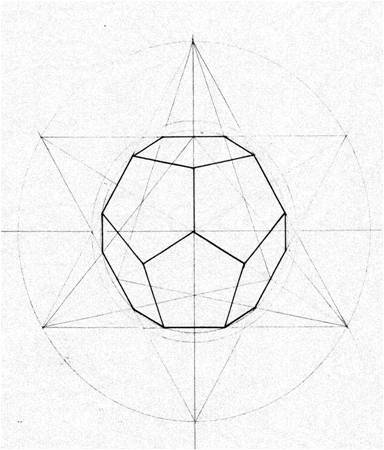 It is composed of pentagrams, joined together to form a structure closest to the most perfect form in the Universe – the sphere. But not a sphere in general but as an energy sphere of structures, based on which can be developed the evolutionary processes of living matter and mainly the Man. Energy structure of the Earth is exactly the same. If one belongs to the School of Pythagoras and only mentions the word “dodecahedron” – he will lose his life immediately. That’s how sacred is this body. 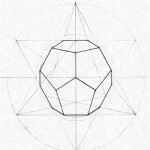 Dodecahedron corresponds to quintessence and that`s why crystalline pentad dodecahedron defines the place in the Wand corresponding to the point that connects people with the subtle worlds. In the architectonics of The Wand, this was the level of the cornice – the border with the gable. 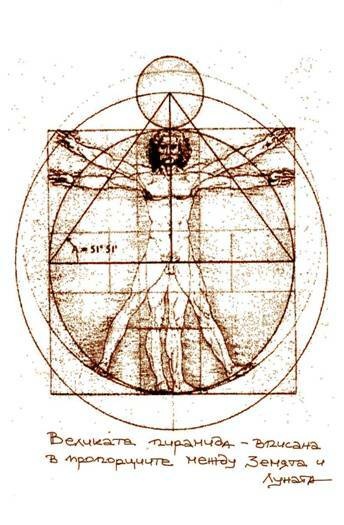 The rest of the Plato’s bodies are also interrelated with the elements: fire – tetrahedron, earth – cube, air – octahedral, and water – icosahedra. At the microscopic level dodecahedron and icosahedrons are interrelated parameters of DNA – the matrix of life. . Dan Winter in his book “Mathematics of the heart” shows the DNA molecule, constructed on the basis of the correlation between the dodecahedron and icosahedrons. The double helix is also related with the Spiral way – the Cosmic Law of the Great geometer. Presented as a winding staircase, it symbolizes our personal desire for spiritual uplift – the Road to the Center. I decided to carve a double helix in the tree girdle of the column – the space for transformation of energy, but stumbled with more information. That was information on the aspects which distinguish each new transformed level of consciousness. 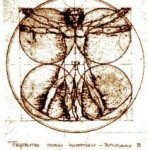 One is the change in the matrix – the human DNA. At that point the information about chromosomes and DNA was adjusted with the era of Aquarius. I built in the active area of the Wand, the matrix of life in its transformation, showing the evolutionary path that humanity has undertaken. The Wand of Unified Consciousness incarnated into a form. The column was ready to bear the architrave. Vertical had to rest down on the horizontal. Dual had to be balanced by the center. 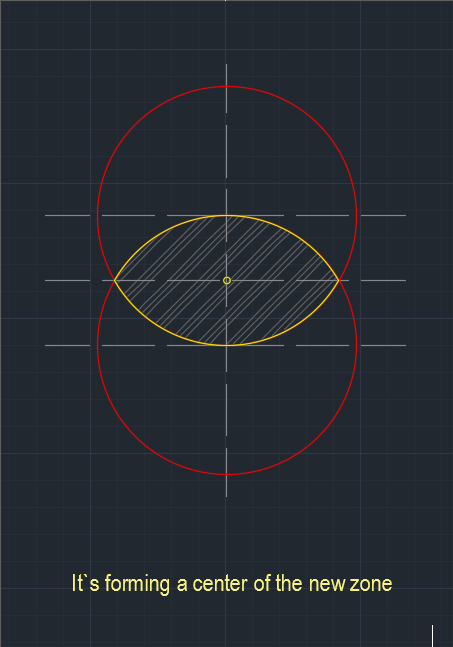 Point in a circle and two vertical lines tangent the circle. 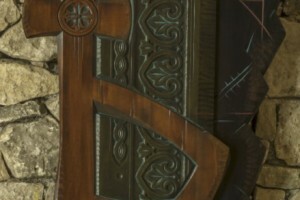 This is the sign of the architrave level in the Wand. Man becomes more perfect with the help of the integrating and luminous power of the rising energy. 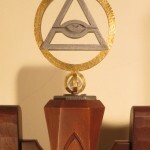 Reaching the Pentagon decahedron crystal, we have already defined it as the point of contact with the new consciousness, we symbolically ascend to the heavenly hard-facade, and there we meet the All-seeing Eye of our Father. 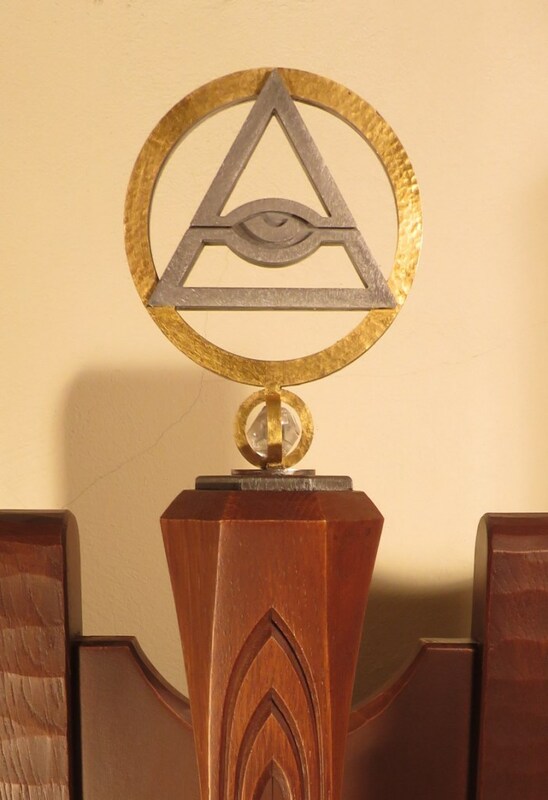 The radiating energy is perceived as a transforming potion through the inspired spiritual Weltanschauung – the woke up third eye (epiphysis), the capitals of the column in our Wand. The sage person, looking trough this eye really sees that all living creatures are composed and interdependent of one Single Radiating Energy. 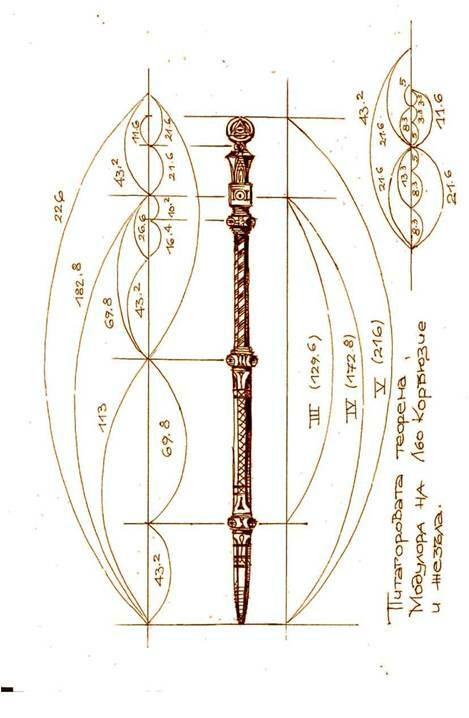 Through the language of symbols, related to the path of spiritual growth, to the transformed level of unified Consciousness during the new ages, the wand has taken the shape of a symbol of the new culture in the Age of Aquarius. So far we talked about man and Universe, and their substantial, energy correlation. 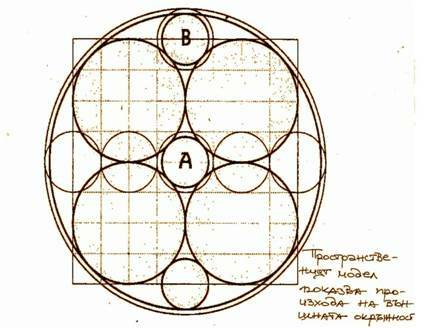 Now we will look at the Human, inscribed in the planet’s structure as the basic module, a symbol of the Golden section and the trinity manifestation in Creativity and its three main plans – Divine, (circle), Material (square, earth) and Human (Pentagram). 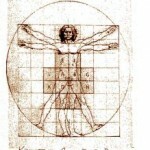 This graph immediately directs us the Leonardo da Vinci`s code. 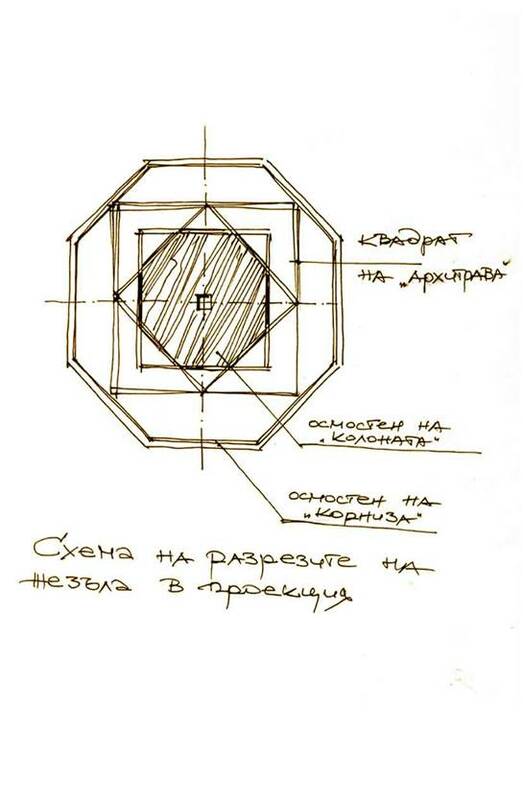 From the renowned drawing we will extract the information, necessary for our study. 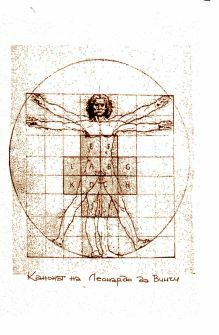 First, the center of the square drawn around the figure coincides exactly with the middle of the body – the place where the first eight cells are. 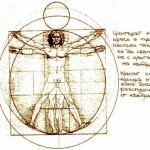 Second, around the figure with the straddle legs is drawn a circle whose center coincides exactly with the navel – the sacral center of the human. 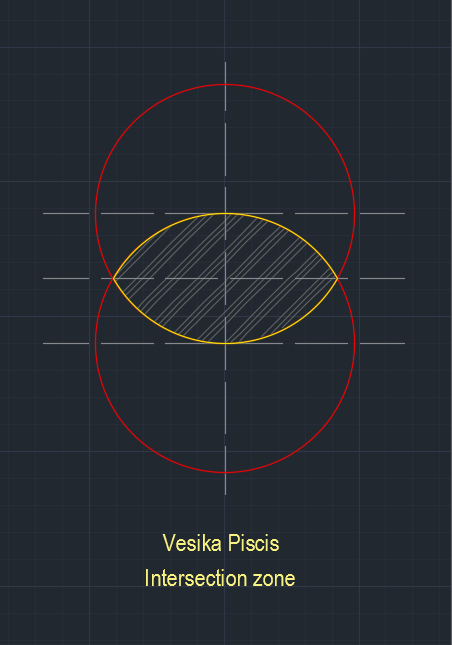 If you move the center of the circle so as to coincide with the center of the square, both figures will be in such ratio where central axis of the circle will be located exactly on one palm distance from the square, and the distance by which we moved the circle will be also one palm. 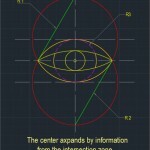 One second experiment shows us that if you draw a circle which is circumscribed within the square (around the figure from da Vinci’s code) and draw another circle whose center is located on the already drawn outer circumference we will receive the circumference ratio which equals to the ratio Earth – Moon. 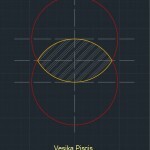 The Moon radius applied to the Earth with a module – the human figure is the distance to the point of extended consciousness. 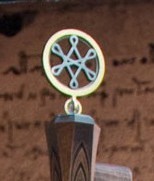 In other words, the transcendental point (on the Wand corresponds with the pentad dodecahedron) coincides with the Moon center (with the provision that the Moon circle touches the Earth circumference) and is located on one palm distance above the man’s head, if the man is inscribed in the Earth circle. 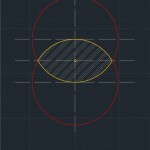 Furthermore, the perimeter of the square described around the Earth and the circumference of the circle passing through the center of the moon (from the same graph) are equal. 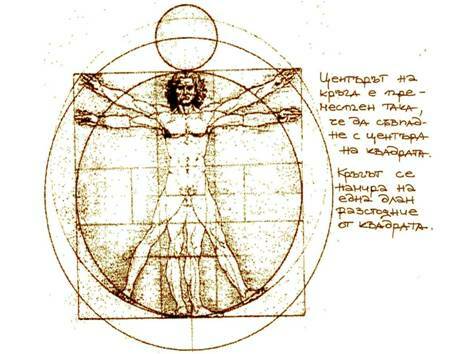 Drunvalo Melchizedek inserts the first eight human cells – the Egg of Life, into the de Vinci’s code and compares the obtained model with the dimensional model of the Metatron`s cube. 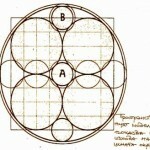 He also describes that while looking for the relationship between the circle and the square in the Metatron`s cube, he receives information that the circumference of the circle and the perimeter of the square are equal. The relationship between the square and the circle is the same again. This is the so-called squaring the circle. Here is yet another fact. 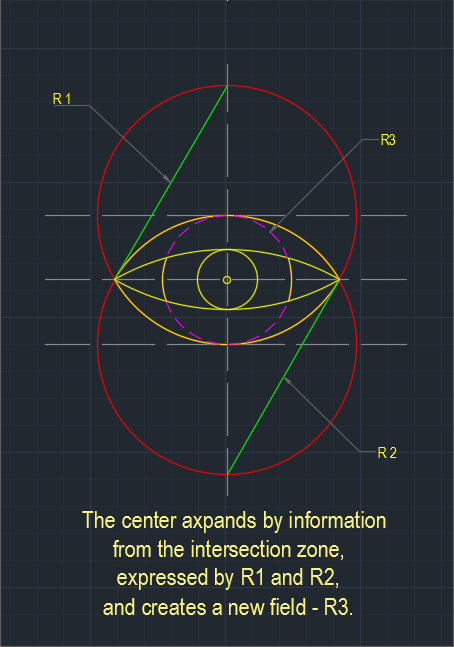 If we draw a horizontal line through the Earth’s center all the way to its circumference, then we connect the intersection points with the Moon center we will receive a triangle with the exact proportions of the Great Egyptian Pyramid. The dimensions of Earth, Moon and Man and the first eight cells are in a harmony. This definitely inspired me to look for a link between the so far reviewed cosmic harmony and the wand and to proportionate it with a message in it. I defined the Wand as an instrument for the Universe correlation and the Human as a measuring unit for it . The Wand is already defined as correlation. It incorporates in itself the correlation between Earth and Moon, and between man and the first eight cells, locked within the squaring of the circle. 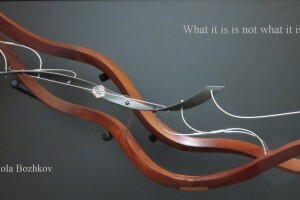 As a woodcarver artist, I’ve always been interested in interconnections, numerical sequences; golden section and the experience gained from different civilizations, but what I use daily are standards from the system “Modulor” of the French architect Le Corbusier. It works by combining foot-inch (imperial) and metric systems. Foot, inch, step, elbow, and span – all measures related to human. Even more importantly – they are all in proportion to the Golden section. The measurement unit in the system is a man with a height of 182.8 cm (6 feet). I was eager to impose the Modulor figure over the scheme illustrating the correlation between Earth and Moon. 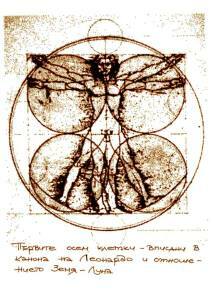 Inscribing the human figure in a circle representing Earth, the lifted hand coincided with the far end of the circle representing the moon. My excitement was rewarded. The golden section has once again proven the Great Synchronicity, and the Wand has become its instrument. So now the Wand was defined as a correlation and now it had a measurement value as well. Through the Modulor system I defined the dimensions of the different girdles that composed its architectonics. As a master my heart start pounding. – What the master does when starts building a house, church or school? 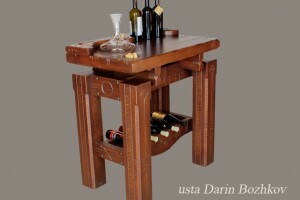 – He marks the boundaries of the construction and measures the right angles. – What kind of instrument he uses to measure the right angles? 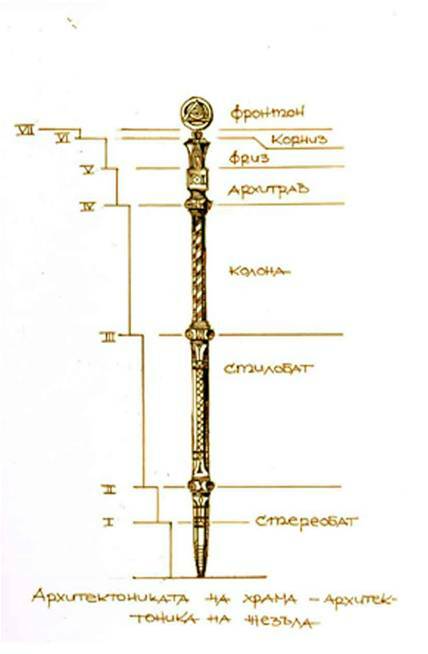 The first thing that certainly was marked on the Usta Kolio Ficheto’s wand were three values marking the following relations: three parts to four parts to five parts. The wand of proto Master Kolio Ficheto bears the Pythagorean Theorem in its living form. The remaining measures were similar to those of our wand, because at that time the measures were taken in steps and elbows. I applied the Pythagorean Theorem with the numerical values of the Modulor on our Wand and it turned into a tool for measuring the right angle. I was glad with that reinvention! At that moment I saw the wand in its entirety. 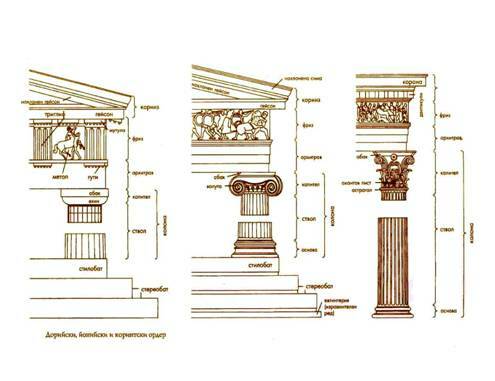 With architectonics, which has endured the burden of time from ancient times to nowadays, proportionally craft by the rules of Golden section and Fibonacci’s sequence of rows from the Modulor system with inscribed symbols assisting the seeking person in the spiritual path? I imagined a strong hand, striking with it the ground. 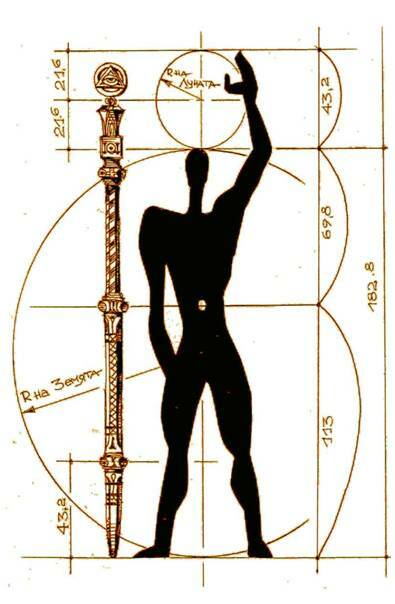 The wand in its entirety is a symbol of the masculine offset, a symbol of the Creator – Fertilizer of matter. 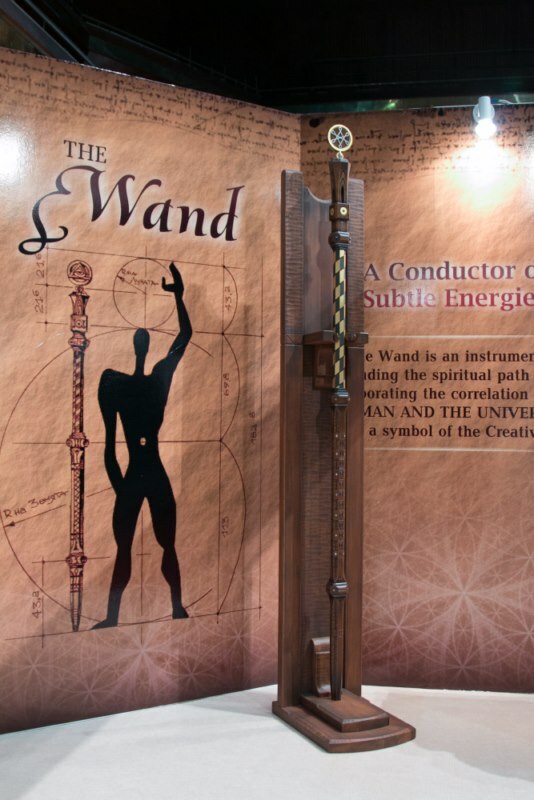 Can The Wand be a conductor of subtle energies? How will he betray them and to whom? The question before me was left open. The great synchronicity locked in The Wand, only gave me reason to think that there were other connections between man and space from here. So much information, and locked in a bludgeon! I didn`t know why, but through the cavity in the core of The Wand I passed a metal string …?! Do you have to ask a question about every outline or color of the artist, why is it red or yellow or purple? Something in me wanted the stretched string and I wrote: “If anybody comes who knows what`s going on, I`m ready to go further”. The man “appeared”. 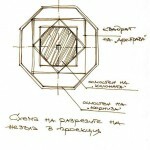 He presented himself as a scientist-physicist by the group of Bulgarian physicists, prepared for the Large Hadron Collider in CERN, Switzerland. I was impressed! The Universe answered me so fast! The next step was to set the string in The Wand, but this step brought up new questions to me. I was looking for new information confirming the correctness of the chosen tone of Earth vibration. (At the same time we`re talking about cosmic energies?!) Is Earth anything different than Space? the year is 1939 and Germany is conducting studies and scientific experiments related to the vibration of Earth. At the initiative of Goebbels, German Minister of Culture and Propaganda, Hitler issued a decree for production of tuning forks with vibration frequency 440 Hz and the new musical instruments are produced and tuned of theme at 440 Hz. Germany raises the nation`s sound picture, increasing the frequency of the main tone. This is perceived throughout the world, despite the protests, mainly of the French music community and so La sounds at 440 Hz to now a days. Until now a days, listening to music, regardless of the source – radio, TV, internet, life and regardless of the genre – classics, jazz, pop, rock or national whatever, we put ourselves in the sound of the second world war – vibration of aggression, bloodshed, violence and destruction. This sound picture is of the circumstances that makes us physically and mentally ill.
… What can we do? Today we`re talking about compressing time, increasing frequency of vibration of Earth! So the main tone is another! How to run together with the Earth? We can go to the mountain, graze a flock of sheep or goats, listen to the whirlwind of the streams, the song of the birds and the wind in the tree branches – than we`ll be together with Mother-Earth. But how many people would leave the comfortable armchairs in the urbanized structures of the city? We can listen by record relaxing or meditative music or natural sounds that (unknown why) are not recorded in real frequency. Authors of such records correctly note that the natural sounds are modulated at frequency 432 Hz. Well done! Indeed 432 Hz is an extremely harmonic frequency, but it returns us to the 16th century. Again we`re placed at a low frequency of vibration, relative to the vibration of the Earth. We`re lagging behind the frequency of vibration of Earth and we can’t harmonize ourselves with it, accordingly we can’t harmonize ourselves with the Cosmos. In fact, the sound picture around us must correspond with a basic tone of Mother-Earth`s vibration. I set the string in The Wand of a tone in the first octave resonating with harmonic frequency of vibrational range of the Earth. The frequency of vibration of Earth fluctuates from 7.34 to 8.06 Hz (measured in February 2016). That`s why the selected frequency in this oscillation is above 469 Hz, i.e. higher than La# (A-sharp). The Wand began to generate energy in the simplest way. 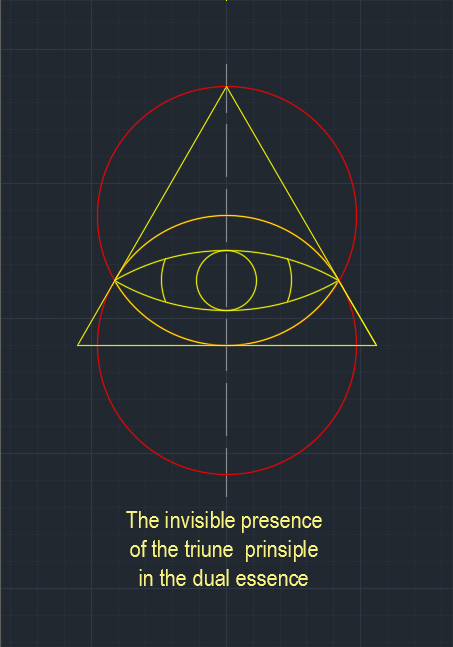 Principle that is studied in 7th class in physics – the principle of resonance. 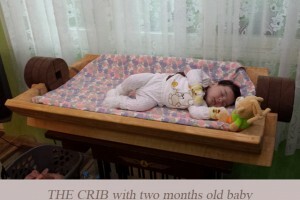 for 2 months (Feb. – Apr. 2016) the resonant frequency of Earth`s vibration has risen by 11 Hz . Over the past years, step by step, from a bearer of knowledge and information, The Wand has become a unique energy harmonizer. constantly vibrating string, resonating with the frequency of Earth`s vibrational range. 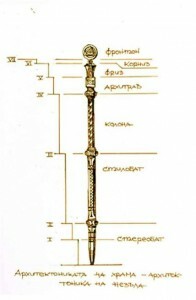 The Wand a piece of art, sculpture and mystical accessory. The Wand is a precise instrument and can be tuned to different vibration frequencies. From the writing about the shaping of The Wand, it is clear that as a thought-form it exists both at micro and at macro level. Then, what kind of energy does it attract? This question was posed by the initiates in Nepal during my participation in International Symposium World Wood Day (WWD) 2017 in Kathmandu, Nepal. 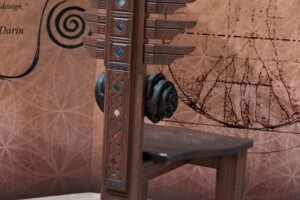 The answer came the next morning – as the sign symbol in the ankh of The Wand, such energy attracts it. 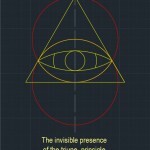 The Triangle of the All-seeing Eye carries within itself the sacrament of the sacred geometry of Light. 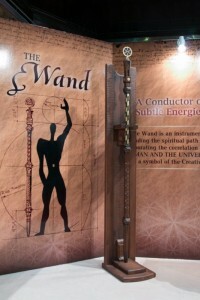 The Wand has become the conductor of the multi-dimensional energy of Light. Over the past few years, step by step, from a bearer of knowledge and information, The Wand has become a unique energy harmonizer. permanently vibrating string, tuned at resonant with vibrational frequency from vibrational range of the Earth. The Wand is a piece of art, sculpture and a mystical accessory. 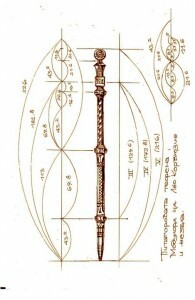 The Wand is an instrument for the spiritual path to achievement higher levels of consciousness, containing within itself the ratio between Human and Universe, and it`s a symbol of the creating principle.